On Saturday, 3,711 families, about 67 percent of the 5,473 families, cast their ballots in a rare vote supporting the demolition of their homes in Jiuxianqiao sub-district in Chaoyang District, Beijing. After 12 hours of voting, two thirds of the votes were for the urban renewal project, but not without many residents showing their mistrust of the entire process. The vote is to see how many people would support the compensation policy for demolishing the old buildings, a plan that has changed several times to meet residents' requirements. At 8:58 pm, two minutes before the end of voting, a residents' representative took his watch and began the countdown. Right after 9pm, two notary officials sealed the ballot box on each side, signed their names and then waited for security to move the box into the counting center at a nearby gymnasium. The whole procedure was scrutinized under the close watch of residents' representatives and journalists. However, the suspicion of fairness still runs high among local residents. A middle-aged man said he couldn't find the serial number on the notary officials' uniform and thought they might not be authentic notaries. Officials denied this, saying they were all from the Beijing Notary Public Office. 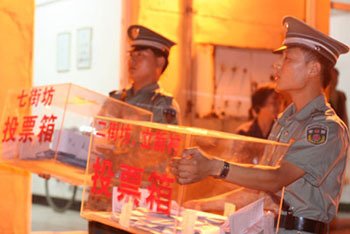 The security men moved all seven ballot boxes from the six polling stations to the counting center, which was illuminated by spotlights and decorated with colorful flags and red banners. The counting only began after disputes over the counting procedure delayed the voting for about one hour. At first, the residents' representatives were allowed to sit close to the notary officials and monitor the counting. But when a young referendum organizer urged the representatives to leave the area, one 70-year-old man surnamed Zhou, also a residents' representative, refused and demanded to know how their rights would be protected if he couldn't see the counting directly. Residents who were watching along the sidelines also shouted in support of Zhou. Ba Changrui, deputy leader for the Jiuxianqiao Sub-district Office, chatted with Zhou briefly, but failed to persuade him to leave. Then other residents' representatives went back to their seats too. Notary officials and residents' representatives counted every vote carefully. On every table, there were hot discussions and sometimes quarrels due to the difference over certain ballots. In the end 32 ballots were spoiled. A residential vote observer surnamed Wang said that the result was useless. Another resident's representative, who monitored the counting, said that 1,700 families didn't turn out and most of them were opponents to the compensation policy. But a reporter said he met a woman who came to the ballot booth four times because she didn't bring enough documents for identification purposes. And another resident explained that some of those who didn't show up to vote were not well-educated and didn't understand the process. Ba explained the vote helps the government and developer to understand people's ideas about the demolishing project, and the vote will not decide when the demolishing will begin. During his closing remarks after the results were released, Ba urged residents to be patient and wait for the developer to propose new plans. Throughout the day, residents were anxious to tell the media their side of the story, even though some even questioned if reporters can tell the truth. Those residents, mostly seniors, circled around reporters and told them how they felt the current compensation policy was unfair. A man with white hair and wrinkled face said he devoted his younger years to work for a state-owned company with low income during the planned economy period and he only wants the government to pay more to him now. Another man surnamed Zhang claimed he has two rooms totaling 50 square meters in one of the old buildings and under the current compensation policy will only get a new home of 70 square meters. He will agree to the demolishment project if the amount of space offered room will be doubled. Meanwhile, a well-dressed woman also in her sixties urged residents to be realistic and not so selfish. The woman said residents should not be too demanding and the local government had made great efforts in trying to come to an agreement between the residents and the developer. Officials from the Construction Committee of Changyang District told Beijing Morning News that law or administrative measures might be used for those residents who asked for unreasonable conditions for demolishing their homes.